By far the biggest remote game we've played to date. The brand new table with its river and hill sections, the bridges and some unseen miniatures allowed us to entertain our ever demanding audience once more. The separation of tasks between Gaj and me proved to be most valuable. The collaboration allowed us to work out the scenario, discuss and introduce new elements to the game as it progressed. The Blood Formatting Engine helped with the technical annoyances of formatting. Using standardized templates various presentational formats could be generated by the push of a button. 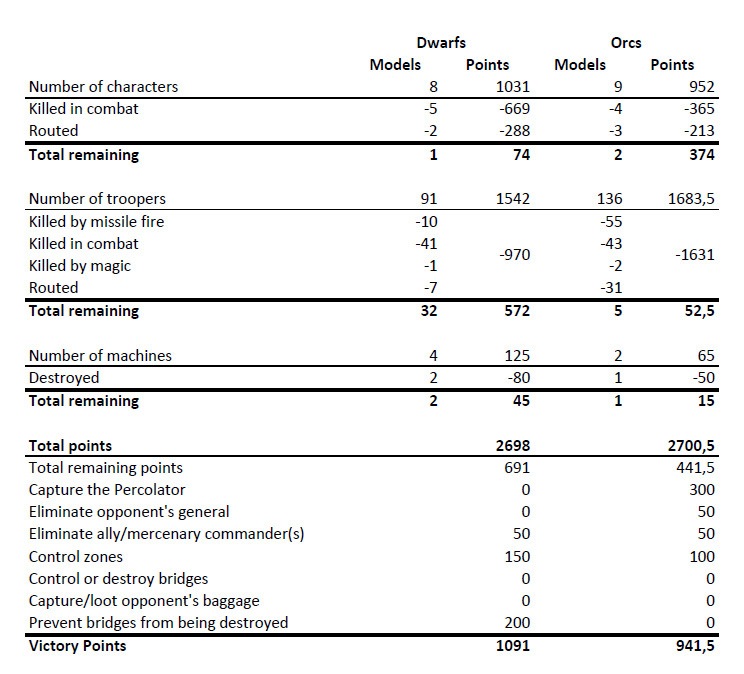 Battle Chronicler was used for making the overview pictures and the players used it to get a better estimation of the unit positions and/or distances. A private sub-forum on the [url=http//forum.oldhammer.org.uk]Blood Forum[/url] was used to publish each phase. Communication with each individual player was done by email or PMs. When we created the scenario we hoped it would draw out the units to the center. The GM controlled chariot and the Percolator definitely contributed to achieve that goal. Obviously, the players did the rest. Throughout the game I tried to be as objective as possible and keep true to the narrative before anything else. The decisions made during the game were always well-motivated and with approval of both players. We used the Hamete Virtual Dice Server to log all dice rolls. The Dicelog proved invaluable to the game and it took over 800 dice rolls to complete it. The WFB3 Rule Reference and WFB3 Army Builder Data Files helped a lot to maintain an overview of the rules, although some minor mistakes did slip through, rule wise, this was the best game I've played to date. Both players were enthusiastic and committed to the game. Their experience and knowledge of WFB3 varied. One player in particular enjoyed asking questions, while the other had a more "go with the flow" attitude. Not everything was game-related and even though we live miles apart, you get to know each other a bit. During the course of the game, someone got promoted, acquired parenthood, children got neglected and marriages being put to the test. I'd like to thank the participants and the community for supporting us. Special thanks go out to Gaj for his cooperation and for bringing the story to life. A great experience - the Dicelog made dice rolls easy snd Battle Chronicler enabled us to keep track of where units were, although sometimes it became a little tricky to visualise LOS - Dreamfish was most helpful here with great and impartial advice. Speaking of which, Dreamfish did a great job of relaying all the necessary information to keep game ticking along nicely. Why oh why did I forget that most true of all military maxims that no plan survives contact with the enemy. Especially when that enemy turns out to be your own bickering army! 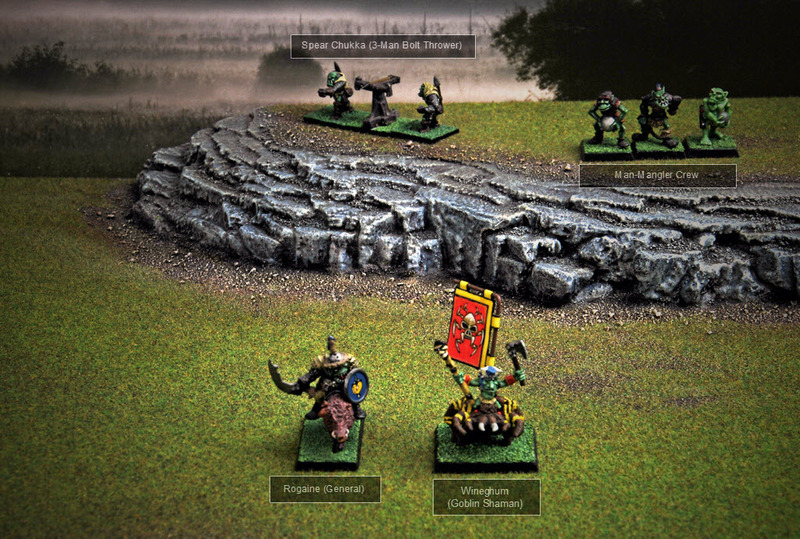 Having spent ages considering the best deployment of my units to reduce animosity and ensure they arrived at their objectives in a timely fashion with support, the whole thing fell apart as the Goblinoid ranks fell to bickering anyway. To compound things the Dark Elf units found that mountaineering wasn't their forte as they tried to get to grips with the Wood Elves in the face of some terrifyingly deadly Dwarf artillery. All I can say is - thank goodness for my individual characters, ther ability to ignore difficult ground, their magic and their fighting prowess! Although my army was pretty comprehensively wiped out and sent running for the hills, I do take great delight in their highly pyrrhic victory! The Percolator is mine, the cream of Dwarf nobility lies dead on the battlefield and I nailed that treacherous dog Master B'tor! The house rules were great and I really appreciated Dreamfish's flexibility and fairness when interesting situations arose. The combat rules made them much more action packed than some of the grinding melees that can drag on for many turns in the original 3rd ed rules. I still think that stonethrowers are somewhat overpowered... or at least Dark Elves too soft! The whole experience was highly enjoyable and this was down to the fantastic team effort of the all the participants. Dreamfish steered a firm and steady course as GM, Airborne was a canny opponent who kept me on my toes for the whole game and Gaj - thanks for the brilliant story telling which is what this game is all about! Dreamfish was a perfect host/GM making it work across three months and an ocean. I think we averaged one turn per week which is quite an accomplishment. All of the game aids mentioned by Dreamfish are easy to use. Communication was smooth and quick. We met in the middle as Dreamfish intended then slogged it out for about 7 turns. Tactically my goal was to first crush the Dark Elves, and keep the Greenskins held up with my ranged weapons. As it turned out The Greenskins did the work for me with animosity. Mastor B'tor proved to be an awesome character and single handily destroyed my Woodelves. That is when my plan had to change. I vowed to keep lines and stay as a cohesive army. However around turn 8 the action got the best of me, and the game board became a jumbled mess of single unit combats. Isn't that how it always turns out, lol. Note to self, dwarves are slow. My time table for my moves became a bit bogged down by being unfamiliar with them. However once they got stuck in they preformed admirably. The losses from the dwarf line turns 8-10 came more from terrible dice rolling (thanks dice log)!!! I also got excited and attacked that last turn when I should have probably consolidated. I really wanted to kill Thantsants characters though especially Wineghum. Dice log is an amazing game aid and make things very simple. There were some points when I was on the edge of my seat about to hit roll, "Why dice log have you forsaken me!!!!!" It was my undoing in the end. Poor Borri rolled nothing but 1's for his challenge, ugh. Winghum helped dicelog out as well with some tactical mist, that might be the move of the game. 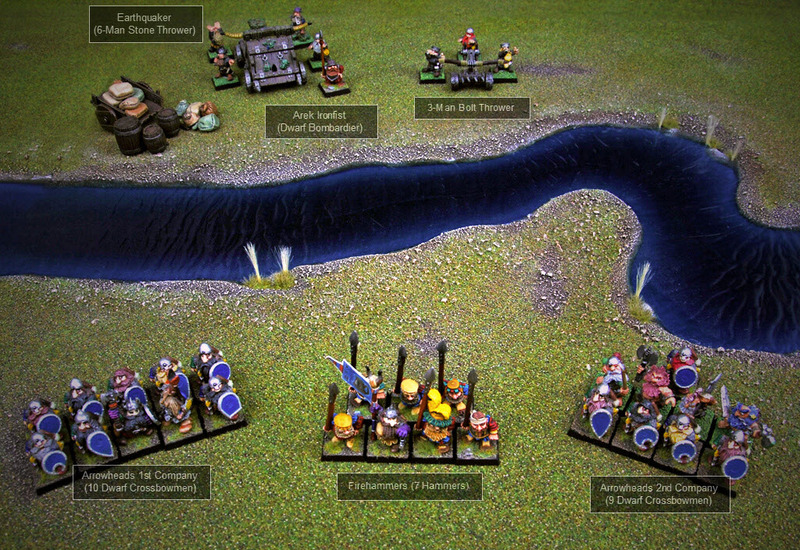 Thantsants kept my warmachines down for 4 turns, then unformed my whole dwarf line the last time he used it. Victory was mine but felt hollow. I held the river but at what cost? The Percolator had been stolen, and Morgrim and most of my characters where dead. It made for a heck of a story though. Dreamfish staid as impartial as possible, if a question was raised, all three of us made a fair and cooperative decision. We must remember this isn't about being competitive but becoming part of the story. Dreamfish's house rules really streamlined things, and the remote gaming game turn worked out really well. I especially like two rounds of combat back to back. It made things quite bloody! Dreamfish was and awesome host/GM, Thantsants was a great opponent, and Gaj being our scribe has done an amazing job! I would gladly participate again. If anyone has some specific question about the game or my participation I would be happy to go into more detail so feel free to ask.